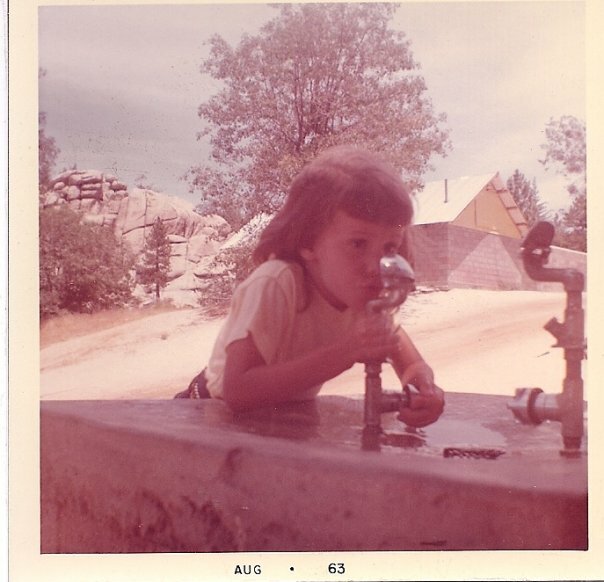 I’m 54 years old and writing a letter to the you that existed 50 years ago, captured in a picture that someone took of you at Knott’s Berry Farm in the summer of 1963, just before you turned 5 and started kindergarten. How cute you are! And such an imp! It’s great that you have a wonderful sense of humor and a desire to know and explore everything, but maybe you should stop wandering off and making people look for you. And maybe don’t play so many practical jokes on your loved ones. They might laugh at first, but they might also get really upset with you. So, your dad is gone and your mom is raising you and your sisters all by herself. That’s profound and I don’t expect you, at 4 years of age, to realize it yet but maybe as you get older you can help out more often and show appreciation to your mom and oldest sister for all they do to try to take the place of your dad. It’s a very bumpy road ahead and you should learn to pay better attention so you can understand how to be a part of things, a part of solving and fixing things rather than just focusing on the next fun time, the next happy occasion. There’s a lot of life happening in-between the parties and the big family gatherings and the road trips to California and Florida and New England. Pay attention! I know, if you were four years old today, you’d probably get some sort of attention deficit diagnosis because it’s obvious that you still have a hard time concentrating and listening. If you can focus on that problem now, as a kid, and try to fix it somehow then maybe it won’t be so difficult for your future self. Wake up, Kim! Absorb what is happening around you! But don’t worry too much if you can’t make it happen. You’re four. Go get a popsicle and find an anthill to watch. Your mom will find you when it’s time for dinner. Mostly, you’re a pretty good kid. If you could concentrate and not daydream so much you’d eventually be a straight-A student because you’re very smart. You’ll search outwardly for a lot of years, through a lot of different philosophies and religions for something meaningful to you, something to help you frame your life. The searching and reading are good, but the one place you’ll avoid looking is within yourself and that’s where all the answers are. Start tearing the walls down now instead of building them higher and higher as you grow. Try to look inward honestly and stop being in denial about how sad you are. Maybe then you can do something about it. Maybe then they won’t send you to a shrink in five years, when you’re 9 and almost nothing makes sense. It’s a crazy world but it’s not your fault. Stay on the path of goodness and everything will turn out okay.